See Gnosis Magazine for a version which includes a glossary of common Sufi terms. I can still recall the first time I ran into someone purporting to be a Sufi. I was visiting San Francisco in 1971 and had just met the long-haired printer who was publishing an underground comic that I was co-editing. He sported a worn denim jacket with a large winged heart embroidered on the back in the homespun fashion of the time. Having seen that symbol around before, I asked him what it stood for. "Sufism," he replied (or something to that effect), which led me to inquire about what that was. The gist of his response was that Sufis were proponents of love and he was a part of a local Sufi group that held "Sufi dancing" every week. "You oughta come," he opined. "It's a great place to meet chicks!" As it turned out I didn't go Sufi dancing, I didn't meet any Sufi "chicks," and my later relations with that printer were soon clouded by his deplorable business sense, all of which left me with an extremely confused notion of Sufism. A couple of years later, having now moved to San Francisco, I went to a reading by Allen Ginsberg which was preceded by a performance of the Sufi Choir, a Bay Area phenomenon of the time. Given their mixed repertoire and Marin hippie sartorial style, the Sufi Choir didn't ease my confusion about Sufism one bit. On the one hand I had heard that Sufis were Islamic mystics (though surely the printer with the denim jacket and the Sufi Choir didn't match that image); on the other hand I had read a short book by Sufi teacher Hazrat Inayat Khan that emphasized the unity of all religions. This sounded fine, but all the parts didn't fit into a coherent whole as far as I could tell. More years went by and I became vaguely aware of other Sufi voices. There was Idries Shah's book The Sufis, which championed the notion that Sufi ideas and influence were all-pervasively behind the scenes in world history, and whose back cover claimed Shah was "Grand Sheikh of the Sufis"! There were Sufi orders like the Nimatullahi and Helveti-Jerrahi that came on the scene and seemed very Islamic compared to earlier Sufi groups. The more I read and observed about Sufism, the more mystified I became. I was not alone in this. Idries Shah's imprint, Octagon Press, even published a collection of essays called The Sufi Mystery, addressing this confused state of affairs. Was Sufism "within" Islam or beyond all religions? Were Sufi groups cults? Lingering hippie enclaves? Fronts for Islamic preachers? Launching pads for mystical inquiry? Perhaps all or none of the above? What, in short, was going on? If one persists long enough, eventually light begins to dawn. Around 1981 I experienced a spiritual awakening of sorts in a context that had nothing to do with Sufism. Nevertheless, in its wake I found myself with a sympathy for and rudimentary insights into various religions for which I had previously little interest. In that circumstance the original idea for GNOSIS arose, and a few years later in 1984, as I was still pulling together issue #1, I was contacted out of the blue by a dervish (a student of Sufism) whose shaikh had seen a brief announcement of GNOSIS's coming existence in CoEvolution Quarterly and suggested he get in touch. Shortly thereafter the dervish in question came through town and visited. He brought with him a love of both Islam and Judaism, and perhaps most importantly, a palpable sense of what Sufism might really be about. In our conversations, which lasted for several days, I was introduced to a perspective based on experience that resolved some of the apparent contradictions that had previously puzzled me, and gave me some clues into looking at the mystical heart of Islam in a positive way. Soon I met the Shaikh who had triggered this interaction, as well as some other local dervishes of long standing. My image of Sufism began to slowly flesh itself out from different angles. Eventually I journeyed to Turkey and was blessed with further contacts. There is no secret confession here: I didn't join a Sufi order nor does GNOSIS have some secret Sufi agenda. Rather, the end result of this growing familiarity was simply the resolution that Sufism and Islam were as deservedly a part of the mix in this magazine as were mystical Christianity or Judaism or the other strains of Western esoteric tradition that were more familiar. Yet it has taken us eight years to get to the point of devoting a whole issue to Sufism. We've not been in a hurry to do so because dedicating an issue to a single path (as opposed to a more general topic) risks losing readers who don't have a preexisting interest in that path. However, we took that risk with our issue devoted to Gurdjieff and the Fourth Way a couple of years back, and it turned out to be one of our most popular issues ever! It is our hope that there is a sufficient interest in (or at least curiosity about) Sufism among our readers that this issue will find a receptive audience as well. In addition, a better understanding of Sufism is particularly urgent at this present moment for at least three reasons. First, if Sufism embodies the true essence of Islam as many contend, then grasping what is attractive about Sufism may help us Westerners gain a more complete picture of Islam than the mass media usually provide. With their focus on conflict and drama, bolstered by cliched gut-level reflexes that date back to the Crusades, our media more often than not fan the flames of indignation that the West feels toward Islam - and vice versa. As the tragedy in Bosnia continues to unfold, and as a few Muslim militants command the spotlight with ill-conceived terrorism, it is imperative that we become familiar with the praiseworthy side of Islam to balance out the overwhelmingly negative fare that we are most familiar with. An issue of GNOSIS devoted to Sufism is at least a modest step in that direction. Secondly, the present state of Sufism itself seems to call for clarification and the opening up of a dialogue among its various camps. In conversations with students of Sufism both here and abroad, it has become apparent to me that there is a crying need for an informed discussion of what is truly essential within Sufism. Too many dervishes are hobbled by the belief that their order embodies the only "real" Sufism, that their shaikh is really the greatest master, and that they have little to learn from other quarters. The antidote for this is not a cheery ecumenism that embraces anyone and everyone who hangs up a Sufi shingle. Rather, what seems necessary is the growth of a sense of discrimination (in the best sense of the word) fueled by an informed overview that helps put things in perspective. We hope some of the material in this issue can help in this effort. But none of this would matter if not for the third reason behind this issue. And that is that matters of Islam or intra-Sufi communication aside, Sufism undeniably exists as a living esoteric tradition of human transformation and as such is a valuable resource for the Western seeker. It has been noted before that unbroken chains of transmission of mystical teachings are hard to come by within Western culture. For various reasons, including the long dominance of a church which frowned upon (and often explicitly punished) most mysticism or esotericism not mediated by church authorities or theology, these currents in the West have been primarily underground and sporadic impulses. The case of Sufism provides an interesting contrast. Islam, whatever its other supposed drawbacks or virtues, has generally been hospitable to mystical inner experience, although one wouldn't know this from the versions of Islam that have received the widest publicity. Within a few centuries of the religion's founding, Sufi orders had become recognized and often influential institutions within Islamic society teaching a methodology of attainment. In later centuries, Sufis sometimes enjoyed the favor of the authorities in Islamic cultures and sometimes came under fire, a tension that has continued to the present. In any event, the order's lineages and mystical practices largely survived unbroken. The present orders each descend from a great saint or teacher of centuries past who developed a curriculum of spiritual growth with the aim of raising those around him to the highest station he had himself attained. As with all such inner technologies, the methods did not carry foolproof guarantees of enlightenment. But they helped push a sufficient number of seekers across the threshold for the methods to be passed on as living systems periodically recalibrated as cultural conditions changed. Some folks theorize that many of the esoteric impulses of Europe, from the Middles Ages on, point to Sufi influence. The Knights Templar are said to have brought back Sufi elements from their contacts in the holy lands. The mythical Christian Rosenkreutz of Rosicrucian fame is described as journeying to the East. Some have hypothesized links between Sufi love poetry and the rise of the Troubadours. All of which suggests that, for the West, Sufism is not so much new as it is previously unrecognized. How then do we approach the task of learning what Sufism has to offer? One method is to become acquainted with the writings of classical Sufism: the poetry, tales, and teaching texts of the greatest Sufis in centuries past. Maureen Clark's article on page 16 takes this tack and provides a lucid summary of Sufi basics. (Supplementing this, a sampling of poems by five great Sufi poets can also be found on page 32.) A further step is to clarify the Sufi work in the present time and its effect on individuals who undertake it. Kabir Helminski, who has written on Sufism for us before, provides this perspective with his article on page 26 discussing the Sufi goal of wholeness in life. For further background on contemporary Sufism, a short account of Sufism's introduction into North America can be found on page 20. For many readers, the question of Sufism's relationship to Islam will likely loom large. Interestingly enough, the Qu'ran itself defines Islam (literally "submission" to God) as the primordial religion recognizing one God; in other words, it suggests that Islam predates by many millennia its formalization in the hands of the Prophet Muhammad and the Qu'ran. Many Sufis consider Sufism to be the essence of that primordial Islam. Three articles herein touch on the question of Sufism's identity. Kabir Helminski supports the view that Sufism is at heart Islamic mysticism, and that its serious study necessitates an appreciation of the message of the Qu'ran and its messenger. Murat Yagan, on page 42, presents the view associated with his Abkhazian tradition of Kebzeh that essential Sufism had its origin in the Caucasus Mountains 20,000 years ago and continues to the present both inside and outside of Islam. Contributing editor Ya'qub ibn Yusuf, on page 60, wrestles with both these views and others provoked by his own experiences, and concludes that the Sufi path is wide enough to include those deeply involved with religious/spiritual traditions other than Islam. Persistently, the greatest sticking point for Westerners in considering Islam (and by extension Sufism) is the status of women in Islamic societies. Traditional societies in general (and not merely Islamic ones) tend to dictate gender roles that strike us as restrictive and unfair. In this context, it is interesting to realize that Sufis have not only included women within their ranks, but that great Sufi leaders, most notably Haji Bektash Veli the founder of the Bektashi Order, have championed women's rights within their own societies. Camille Helminski's article on page 50 provides an introduction to women's involvement with Sufism in light of these facts. 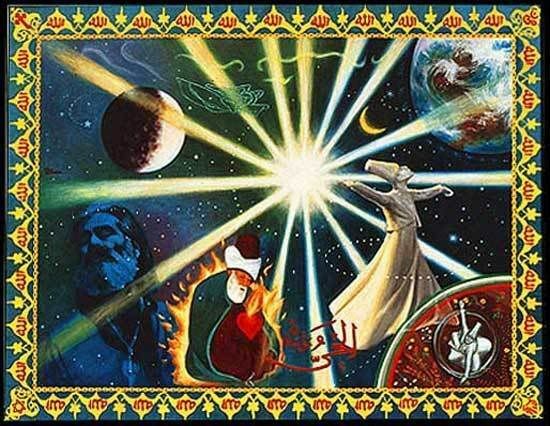 The Sufi work is foremost the quest for gnosis (ma'rifah) - the state of opening or illumination in union with God. The stages the dervish proceeds through along this path constitute a system of spiritual psychology and Yannis Tousullis' article on page 55 investigates the parallels between these stages and Jung's theory of individuation. Our interview on page 36 with Dr. Refik Algan, a Turkish exponent of the Sufi work and a translator of the Sufi poets Rumi and Yunus Emre, provides further insights into this mystical core: the individual's path to discover and know the truly real. Finally, a reader's guide on page 64 points toward some of the best books available for further study on this issue's topic. Of course it is one of the characteristics of living traditions that they are ultimately oral traditions. The creative spark that kindles the inner fire is rarely captured on paper: it shifts its emphasis and tactics with the times and the individual. In matters of the heart and soul, it is the experience of love or of unity that resonates - not doctrines or slogans. This aspect of Sufism is the hardest to convey, although we can catch fleeting glimpses of it here and there in this issue's pages. In other words, the true Sufi, that is, one who has reached realization, may well step beyond Sufism, or any other ism. At such a point, the questions of whether Sufism is Islamic or not, or whether this path is superior or inferior to others, are largely irrelevant. But until we reach that point (whatever we may call it), the Sufi conundrum continues. 1. Quoted in the Introduction to Awakened Dreams by Ahmet Hilmi (Putney, VT: Threshold, 1993), p.x .